Tech Creates Our Political Echo Chambers. It Might Also Be A Solution : All Tech Considered Social media took a lot of blame for intensifying polarization and partisan acrimony during the presidential campaign. Now some startups and researchers are trying to burst ideological filter bubbles. 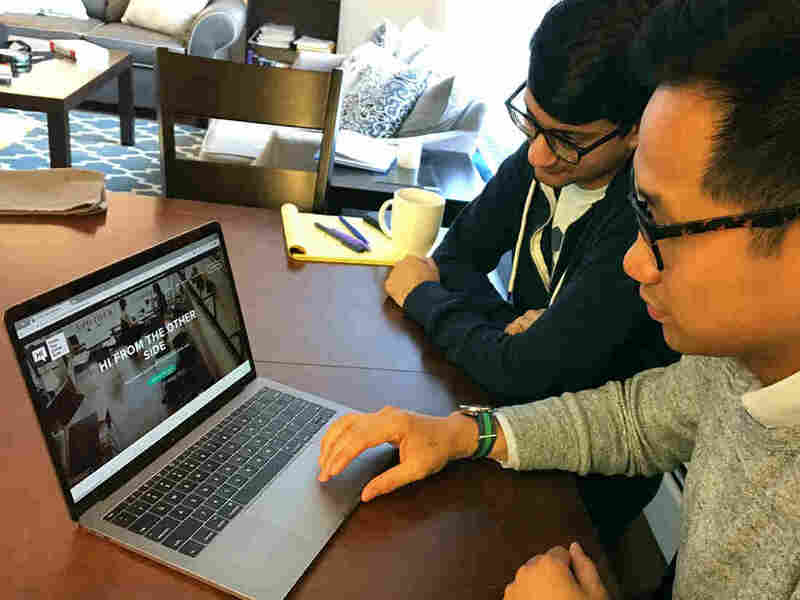 Henry Tsai (front) and Yasyf Mohamedali created Hi From The Other Side, a website that connects people with opposing political views online and then gets them to meet in real life. Lu, like many Americans, was living in a self-selected social media world of like-minded people. The Pew Research Center has found that about two-thirds of adults get news from social media. Analysts have blamed technology for creating an online echo chamber. But if technology created this problem, can it also help fix it? That's the question the tech industry, including a couple of entrepreneurs and researchers, is trying to answer. Henry Tsai had worked in Silicon Valley for the past few years before coming to Harvard Business School. "The day after the election, it was clear that discourse in this country was maybe not where we want it to be," Tsai says. "There's a lot of either demonizing or dismissiveness." He had this idea of bringing people together from opposing political views. In a burst of late-night inspiration, along with some help from a friend studying computer science at MIT, he created Hi From The Other Side. The goal is to take two people from different sides of the political spectrum — a Donald Trump supporter and a Hillary Clinton supporter — match them up, introduce them and allow them to talk to each other in real life. "It's not only to bring people together, but, more importantly, bringing them together in a way that's productive or civil," Tsai says. And that's exactly what Lu wanted as she tried to make sense of things after the election. "At that time, there was a general sense of helplessness on my end," she says. "I just wanted to do something to try to help me just understand." Lu, 27, was one of the first Hi From The Other Side users. She was matched up with Dennis O'Brien, a 26-year-old in New Hampshire working in IT security. O'Brien had voted for Trump, in part, because he hates the Affordable Care Act — also known as Obamacare. But after the election, he remembers seeing young women crying. "All these people were legitimately terrified," he says. "And, I couldn't quite wrap my mind around why." The next day, he saw a blurb about Hi From The Other Side on Facebook, and he clicked on it. O'Brien figured "what the heck" — he could meet someone new and learn what's going through that person's mind. Think of it as going on a blind date to talk politics. Lu and O'Brien were introduced to each other over email and agreed to meet up in person on a Tuesday night at a burger place in Cambridge. "We were there for like two hours," O'Brien recalls. O'Brien didn't know what to expect. "I was really hoping that I just wouldn't get an extremist to talk to, someone who's like 'Hillary or death,' " he says. But luckily, he says, Lu "wasn't crazy." "There was never a moment where I felt stupid or I felt like I was an idiot, and likewise, toward her — I never thought she was anything more than a normal person," O'Brien says. Lu laughed and recalled her first impression of meeting O'Brien. "He's not like a racist, bigoted [person] like I think the stereotype of some Trump supporters are," she says. "I think what helped was also we were able to find a little bit of common ground." The two found a bit of common ground on climate change. But they both realized they also probably just have different priorities. "I really wouldn't say that our conversation changed each other's minds at all, but it was valuable to have that new perspective," Lu says. About 4,500 people have signed up to be matched, according to Tsai, and recently, his nascent startup formed a limited collaboration with Starbucks. Tsai's project is essentially an online platform, but he admits that for it to work people have to move the conversation offline and meet in real life (or at least via video chat). "I think social media just helps reinforce the hate; it just pushes everybody apart," O'Brien says. "Because when I see something [online] I'm not talking to a person, I'm just typing a bunch of letters in a message." But while Tsai wanted to move the conversation off social media, Deb Roy and his team at the Laboratory for Social Machines in the MIT Media Lab were intrigued by the possibility of creating a more tolerant world within those platforms. In addition to his MIT job, Roy is the chief media scientist at Twitter. During the election, Roy had access to the entire fire hose of Twitter data, meaning he tracked essentially every tweet about presidential politics in the country. He noticed clusters of people, self-segregating based on their politics. And as he and his team looked at this big data, they wondered: What if you could flip your Twitter feed and see the world through someone else's eyes? "And, what if some of the things you experience actually aren't so different, aren't so foreign, aren't so disconnected from your interests?" To answer some of those questions, Roy and his team created an online tool: a Google Chrome extension called FlipFeed. FlipFeed has a collection of accounts that span the political arena. "We didn't want to pigeonhole you," Roy says. "So if you flip your feed a few times, you'll just naturally start sampling different parts of the political spectrum." Roy doesn't know what impact, if any, this MIT lab experiment could have. He acknowledged the entire experience could be "really alienating to people." He says FlipFeed downloads are "in the thousands," but he points out — it wasn't created as a consumer product, it was a "tiny little lab project." Still, he's optimistic that technology like FlipFeed can be used to create empathy. The major hitch is that all these tech experiments take effort from users. Maybe a lot of us are content to passively roam around our own social media bubbles. Asma Khalid leads WBUR's BostonomiX team, which covers the people, startups and companies driving the innovation economy. You can follow them @BostonomiX.